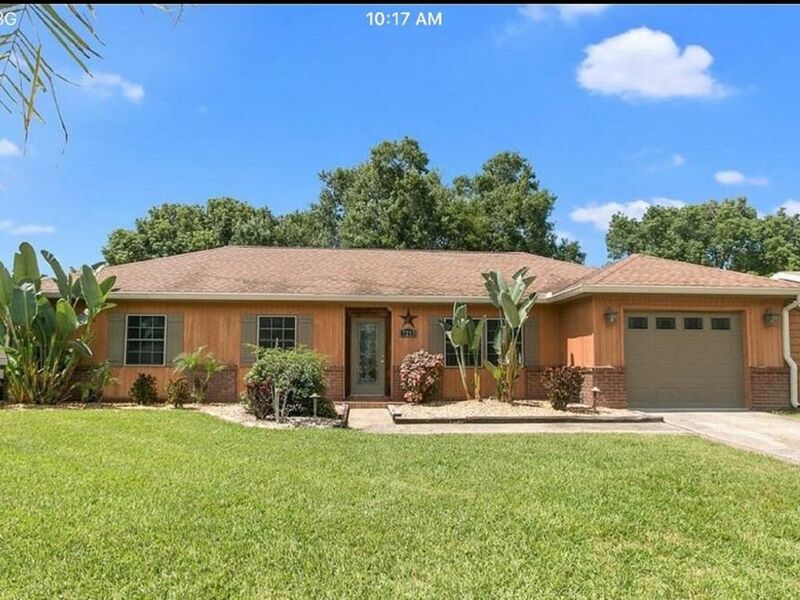 Welcome to Our Home in the heart of Orlando (Dr. Phillips Area) located minutes to all attractions - The Newly created Volcano Bay Water Park, Universal Studios, Sea World, Disney Attractions, Mall and Airport, minutes away from everything one would need while on vacation. The most desirable feature of this property is That its in an UNBEATABLE LOCATION! Our private home has 3 bedrooms and 2 full bathrooms and accommodates up to 6 guests. This home is newly furnished, all bedding has been wrapped for guest protection. This home accommodates a full kitchen, silverware, pots, dishes, dishwasher, washer and dryer, refrigerator, microwave, toaster, coffee maker, blender, towels, bathroom tissue, high-speed wifi and (optional) hot tub during cold months for a minimal surcharge. Unfortunately, this home does not provide nourishments and/or toiletries due to guest preference and allergies. This home is smart capable and only requires guest/s to connect to our personal server. You will be given instructions for access during your stay, which you will have complete access and privacy during your stay. I will personally be available 24/7 during your stay via phone call or text if our home assistant Alexa cannot provide the help required. HOT TUB: In case you want to use the hot tub, there will be an extra surcharge of $20/ per day for entire stay. This money is used to pay electric company. If you wish to add this optional charge to your reservation, let me know in advance and I will submit an additional payment request through Airbnb. CAUTION: Please make sure you consider the dangers of bringing small kids to a house with a pool and or hot tub. Notification upon check-out is required. - Please be respectful to our neighbors. No loud Music after 9 pm. - Cars should not be parked on grass. - No shoes in Bedrooms. - No food or drinks in Bedrooms. - No paper towels, or anything other than toilet paper in the toilet bowls. There are plungers provided, but if a plumber is needed, a charge will be made to you. - Please treat our home like you would your own. - SMART LOCK DOOR CODE: Code will be given to you prior to check-in time. - CHECK-IN AND CHECK-OUT TIMES: Check-In any time after 3:00 p.m Check Out 11:00 a.m. or before *Late departures will incur an extra charge of $25.00 each half hour * *Upon Check-out guest is required to turn off lights, ceiling fans, and all other electronics. Lock all doors and windows. - CHECK OUT LIST: You will not incur any additional charges if the following items are adhered to: 1. No damage is done to the house or its content including the linens. Keep it clean, tidy and take care of things in the home if you break something replace it before you leave. 2. No items are missing upon the inventory check. (This includes, but is not limited to, transferring items to other locations.) 3. All furniture moved back to original locations. 4. All towels in laundry room not on floor. 5. Beds striped down, house is to be left tidy and in broom swept condition. 6. All trash placed in proper containers outside. Use outside bins for all trash Green Lid Trash/ Blue Lid Recyclables. - *DAMAGE AND CLEANING ISSUES: If you experience any problems whatsoever with the property during your stay, please contact me and I will do my best to rectify the matter as soon as it is practically possible. Please note that as Florida is a tropical State, insects such as ants and bugs are occasionally inevitable, and are not cause for complaint. Such complaint does not warrant a refund. The property is treated periodically as part of a pest control program, and is cleaned after each booking. - *OCCUPANCY: Only those persons identified on the booking reservation form are authorized to use the property. Any changes to the persons booked to occupy the house must be notified for insurance reasons. An overnight stay of other additional persons will result in the loss of the full security deposit unless paid additional person fees when booked. If you need to adjust for more additional persons while your stay please send request to us so we may adjust your reservation. - *GUEST assures us that they will observe all conditions and terms of this agreement as to maintaining the rental in good order and appearance and will conduct themselves in a manner inoffensive to neighbors. - *GUEST assures that any who violates any of the terms of this Agreement shall be immediately denied occupancy and shall remedy any damages or other expenses, which are caused by the occupants and/or the visitors of guest(s). - *GUEST agrees that any occupant who is found using drugs or allows others to use drugs on the premises will be immediately denied continued occupancy at these premises. - *GUEST and/or their guests shall not disturb, annoy, endanger, or inconvenience neighbors, nor use the premises for any immoral or unlawful purposes, nor violate any law or ordnance, nor commit waste or nuisance on or about the premises. - *GUEST agrees that during the term of this agreement and such further time as he/she occupies the premises, he/she will keep the house clean and free of trash, garbage, and other waste; and all pipes, wires, glass, plumbing and other equipment and fixtures in the same condition as at the beginning of, or may put in during the term of the agreement, reasonable wear and tear and damage by unavoidable fire and casualty only exception. - *GUEST shall be solely responsible for any thefts, acts of vandalism, or other damage or loss of personal property which may occur during the course of this agreement, whether said damage or loss be the property of Guest or any other person invited in by the Guest. - *SECURITY CAMERAS* The property has security cameras installed at the front, back, and sides of the property for security reasons. Moving, disabling or tampering with cameras may be cause for immediate evacuation and/or the police being notified. Any damages to cameras or camera system will result in a $1000 fee. - *SEVERE WEATHER: We do not refund rents or deposits lost due to cancelled or shortened stays because of weather. Departures due to inclement weather do no warrant refund of rent or deposit. We suggest CSA Travel Protection Insurance during the hurricane seasons. - *SMOKING: No smoking allowed inside the home. A violation of this rule will result in a minimum $150 charge and or loss of the full security deposit. Further charges for extra cleaning may apply. - *AIR CONDITIONING: The Air Conditioning unit MUST NOT be set below 70 degrees in COOLING MODE. All doors and windows should be closed at all times. Failure to comply with this rule could result in the unit freezing over. The cost of having a repairman come out to fix the unit because of it freezing over will be charged to you! - *HEATED HOT TUB: For use of hot tub will be an additional $20/day charge per day for entire stay for use of electric. - *PET POLICIES: No pets. A violation of this rule may result in the loss of the full security deposit. Further charges may apply for extra cleaning and to treat the unit for fleas. - *COMMUNITY RULES: Guest agrees to abide by rules of the community. This home is located in a quiet older neighborhood most of the neighbors are retired or night/day shift workers around town so please keep outside noise levels down during quite enjoyment times from 9:00 pm to 8:00 am. - *FALSIFIED RESERVATIONS: Any reservation obtained under false pretense will be subject to forfeiture of advance deposit and/or rental money and the party will not be permitted to check-in. - *LIABILITY: Guest agrees to indemnify and save HOST harmless from all liability, loss or damage arising from any nuisance or harm made or suffered on the premises by the GUEST, tenants, or guests or from any carelessness, neglect, or improper conduct of any persons entering, occupying or visiting the premises. We accept no responsibility or liability for any loss or damage or alteration to the terms of your reservation caused by events beyond our control, including but not restricted to war, terrorist activity, civil commotion, flight delays, or cancellations, airport closures, and loss of luggage, adverse weather conditions, fire flood, or industrial dispute. We cannot accept any liability for failure of public supplies such as water, electricity, Internet or breakdown of the air conditioning system. Nor for the consequences of the action or omissions of persons who may control or supply main services, or any actions taken in the vicinity of the property reserved, by any authority over which there is no control. We cannot accept any liability for your personal safety during your vacation. It is particularly important that children are supervised at all times in and outside the property. We assume no responsibility for accidents. You are reminded to exercise care as to your personal safety, and the safety of your companions. Whenever possible, valuables should be left secure and out of sight. - *REFUNDS: No refunds are granted for malfunctioning mechanical or electrical equipment including (but not limited to): inoperable appliances, air-conditioning units, pools and/or spas. No refunds will be given for unfavorable weather, early departure, utility service interruption, construction, or maintenance issues. Additionally, there are no refunds for faulty recording or playback equipment, TVs, audio, cable reception, computer equipment or internet access. It will be attempted to repair or replace any items found inoperable as quick as possible, but it cannot be guaranteed that repair will be completed during your stay. The home is nestled in a peaceful and safe community. Its situated on a quite dead end street. You won't have to worry about noise or traffic but this makes it unsuitable for parties. This is a FAMILY environment, and it is not designated for parties and or functions (residential neighborhood)! Home is close to all roads and minutes to attractions - The Newly created Volcano Bay Water Park, Universal Studios, Sea World, Disney Attractions, Mall/Outlets and Airport. Home has personal assistant just ask Amazon Alexa for inquires in regards too restaurants, shops, or area attractions. We advise our guest to rent a car. There is drive way parking for up to 2 cars at the property. Public transportation, Uber and Lyft is also available in the area. Home is close to all roads and minutes to attractions - The Newly created Volcano Bay Water Park, Universal Studios, Sea World, Disney Attractions, Mall/Outlets and Airport.